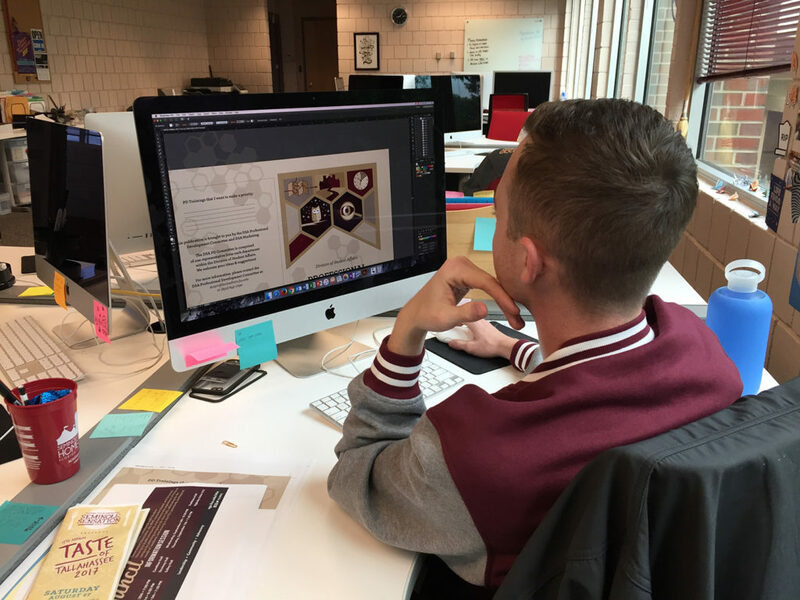 During this summer term, I’ve had the pleasure of working in FSU’s Office of Marketing and Communications within the Division of Student Affairs as a graphic design intern. While I can now say with certainty that the rest of my studies at FSU will focus on fine art, I had spent much of the previous two years studying communications and advertising. Because of this internship, I know that the time I had spent in communications courses had not been wasted. In this position, I have been helping design various promotional materials for clients working within and for the university. So far, this has included tasks like designing t-shirts for university departments and creating posters for student events. Just as I had hoped, the internship has provided me with an encouraging blend of professional and creative experience. Much of my past employment has fit within the “unskilled labor” category, so naturally, holding a position where my creative skills are valued has been a welcomed change. One of the things I have appreciated most about this internship is that it is a constant exercise of technical abilities. The work we do in the office is based mainly in Adobe CC; at first this was intimidating as I came in with a very basic knowledge of Illustrator and Photoshop. After making it through this term, I feel much more comfortable creating complex vector imagery using these programs and have also become versed in Adobe InDesign. As an artist, I’ve found this type of work to be very therapeutic. The work happens on a regular schedule and usually follows a standard flow of “doing things.” While the position definitely requires going through all the steps of the creative process, ultimately most of the work I do begins with direction provided by a client. It’s basically being presented with a new creative prompt every day. When also simultaneously working on personal art projects outside the workplace (which tend to demand tremendous thought and mental energy), this comes as a relief. Additionally, I’ve found great satisfaction in coming up with solutions that help bring the ideas of others into fruition. While I’ve enjoyed most of what I’ve done in this position, there have been some not-so-glamourous moments (e.g. editing and re-editing pieces based on a client’s ever-changing demands). While not particularly enjoyable, I’m happy these are things I’m experiencing as they’re the reality of the industry. That said, I see myself finding a career in this field post- graduation and I think this internship has been an incredibly valuable first stepping stone. My next step is to expand beyond the university gates and find another internship opportunity for next summer; possibly with an ad agency in Orlando that I’ve recently made contacts with.